Kuwait – 3 March 2019:- Abdulmohsen Abdulaziz Al-Babtain Co., the sole authorized dealer of Nissan in the State of Kuwait, announces special discounts and offers on purchased vehicles prior to 2016 at Nissan Body shop centers. Nissan car owners can utilize the exclusive benefits until the end of March 2019. Nissan Al Babtain invites everyone to visit its Nissan Body shop centers in Al Rai and Ahmadi to explore the new advantages. 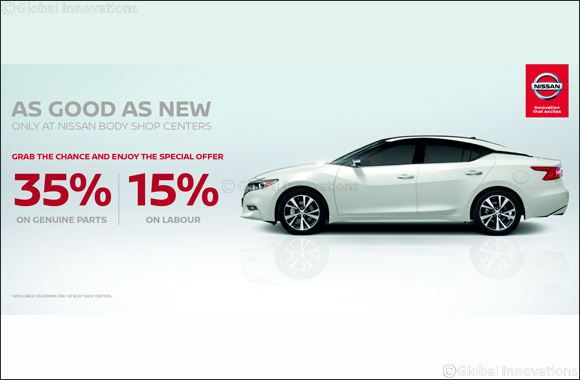 The exciting offer includes a 35% discount on genuine parts and 15% discount on labour when they drive into Nissan body shop centers. The package is applicable on cash repairs excluding insurance packages. Nissan Genuine Parts provides you safety and demonstrate long term reliability, safety and quality configured for each model to provide complete reliability and assurance to its passengers. In order to meet the highest international standards, Nissan owners can visit Nissan Al Babtain body shop centers to repair their cars by accredited technicians and drive off with good-as-new cars.